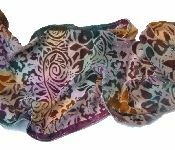 Laurie's passion for colour & texture is apparent in her silk-rayon 'devore' accessories, all hand-cut & hand dyed for total uniqueness. 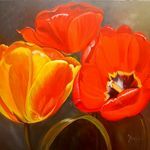 Acrylic and oil paintings of Seascapes, florals, scenic, people, animals, and birds. Bev was born and raised in the Cowichan Valley, and finds inspiration in the beauty of our islands lush forest and the spectacular ocean and beaches that surround it.